Posted on 27, September 2016 by EuropaWire PR Editors | This entry was posted in Aviation & Aerospace, Finland, Technology, Transportation & Logistics, Travel and tagged Helicopter Guidance, helicopter guidance software technology, marine market applications, Stephan Kuhn, Wärtsilä. Bookmark the permalink. The new Wärtsilä Helicopter Guidance software technology is designed to enhance the safety of shipboard helicopter operations. HELSINKI, 27-Sep-2016 — /EuropaWire/ — Wärtsilä announces the launch of its helicopter guidance software technology for marine market applications. Originally developed for military applications, the technology is based on the company’s well known Nacos Platinum navigation system. 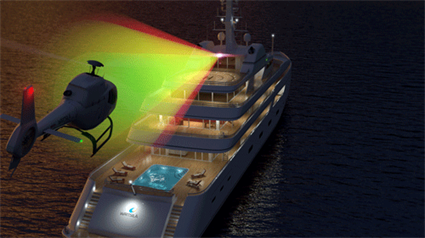 Following increasing demand from the market, Helicopter Guidance has been further developed to suit marine applications, notably in the mega yacht and cruise ship segments. This ‘plug-in’ tool adds a graphic overlay on electronic chart display & information systems (ECDIS) and radar, and shows at a glance whether or not the helicopter is making a correct approach along the right flight path. The “Heli Guidance” feature can be operated and activated manually. To automate this tool, an optional direct connection to an onboard Helicopter Visual Landing Aid (HVLA) system can be provided. For the tracking of fast objects, this can be used in combination with Wärtsilä’s temporarily connectible High Speed Radar (HSC) function. “Mega yachts often feature a helicopter landing area, which inevitably carries an increased risk of accidents, and which require the full attention of the captain and crew. Our novel Helicopter guidance tool is designed to enhance the safety of shipboard helicopter operations, and is an important addition to our technically advanced solutions vessel navigational aids,” says Stephan Kuhn, Vice President, Electrical & Automation, Wärtsilä Marine Solutions. The Wärtsilä Nacos Platinum solution integrates all navigation and automation system controls into a single system that enables the vessel to be navigated, controlled, and monitored from various onboard positions. The truly multi-functional workstations provide combined displays of radar, ECDIS (Electronic Chart Display and Information System) and conning information, as well as automatic steering and voyage planning operations. Meet us at the Monaco Yacht Show, Darse Sud, Stand QS85, from September 28 to October 01.